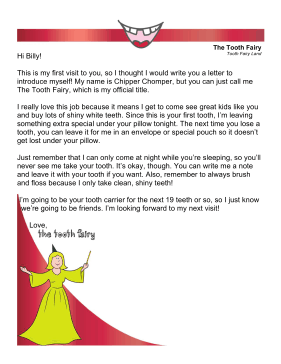 This free, printable letter is for a child's first lost tooth wherein the tooth fairy introduces herself and reminds the kid to brush and floss often. This is my first visit to you, so I thought I would write you a letter to introduce myself! My name is Chipper Chomper, but you can just call me The Tooth Fairy, which is my official title. I really love this job because it means I get to come see great kids like you and buy lots of shiny white teeth. Since this is your first tooth, I'm leaving something extra special under your pillow tonight. The next time you lose a tooth, you can leave it for me in an envelope or special pouch so it doesn't get lost under your pillow. Just remember that I can only come at night while you're sleeping, so you'll never see me take your tooth. It's okay, though. You can write me a note and leave it with your tooth if you want. Also, remember to always brush and floss because I only take clean, shiny teeth! I'm going to be your tooth carrier for the next 19 teeth or so, so I just know we're going to be friends. I'm looking forward to my next visit!